11 Rosshall Place, Renfrew, PA4 0BA. The Knopper gall wasp (Andricus quercuscalicis) Burgsdorf 1783 (Hymenoptera: Cynipidae) has invaded western and northern Europe from southern and eastern Europe over the last 400 years. In the late 1950s the insect arrived in the south of England, presumably having crossed the English Channel on high altitude air currents, and has slowly spread northwards reaching southern Scotland in 1995. This species of gall wasp has an obligate sexual generation in springtime on Turkey oak (Quercus cerris) and an agamic generation in autumn on Q. robur. The random distribution of Turkey oaks in Scotland will limit further northward expansion. This paper describes the Knopper gall wasp’s advance into suitable sites in west and central Scotland. The complex lifecycle of the Knopper gall wasp Andricus quercuscalicis Burgsdorf 1783 (Hymenoptera: Cynipidae) involves an annual obligate alternation between two different oak tree hosts, one introduced to Britain and the other a native species. Fig 1 The lifecycle of the Knopper gall wasp Andricus quercuscalisis. In spring asexual females oviposit into the male flowers of the introduced Turkey oak Quercus cerris (L.). The hatching larvae induce tiny, thin-walled, flask-shaped galls to develop on the catkins in April and May giving rise to a sexual generation. Males and females of the sexual generation emerge in late May to early June of the same year. 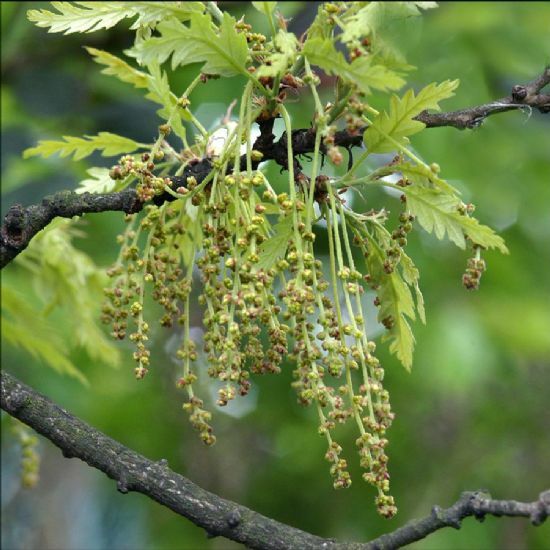 The sexual females then oviposit into the female flowers of the native Pedunculate oak Quercus robur (L.) or occasionally Sessile oak Q. petraea, (L.) where an asexual or agamic generation develops, producing galls on the acorns in the summer and autumn (Stone, 1995). 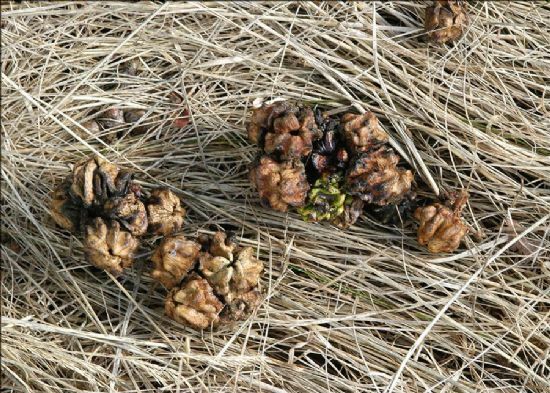 These large, 2cm galls are very conspicuous and consist of a mass of pyramidal-shaped, ridged tissue that breaks out between the cup and the acorn. Occasionally there are two, three or more growths on an individual acorn which completely cover it. The distinctive shape of these galls gave rise to the common name of ‘knopper’ from the German word knoppe meaning a kind of felt cap or helmet worn during the seventeenth century which the galls are said to resemble (Stone, pers. comm.). Russet-green, glabrous and sticky at first, the structures later become reddish coloured. After hardening, the galls turn brown and drop to the ground in late autumn. Inside the gall is a single, large chamber with a small, hard, thin-walled, spherical inner structure at the base containing one larva. The asexual generation overwinters in the hard knopper galls. At the beginning of February the adult asexual female gall wasp emerges through a vent at the top of the gall. These newly emerged insects later disperse to Turkey oak where the cycle is repeated. The obligate generation on Turkey oak restricts the range of this invading species of Andricus in Britain to locations where both species of oak are to be found. Fig 2 Fallen Knopper galls on the ground in autumn. Fig 5 Knopper galls growing from acorns of Pedunculate oak in September. The post-glacial native distribution of Turkey oak was originally restricted to south-eastern Europe and Turkey. In the last three to four hundred years Turkey oak has been planted extensively outside its native range and was first introduced to the British Isles in 1735. This, together with other non-native oak species, was planted in parks, gardens and country estates as an ornamental tree thus creating ‘islands’ of Turkey oak. It is now fairly widespread throughout most of the British Isles. Following human dispersal of Turkey oak, A. quercuscalicis successfully invaded areas far from its native range of central and south-eastern Europe and Turkey. It reached Germany in 1631, arrived in the Netherlands about 1882 and has been known in the Channel Islands for at least a hundred years. The English Channel seems to have temporarily held up the Knopper gall wasp’s invasion of mainland Britain, the first noted in Devonshire in the late 1950s. These arrivals were probably unassisted by human agency and would appear to have been air-borne. 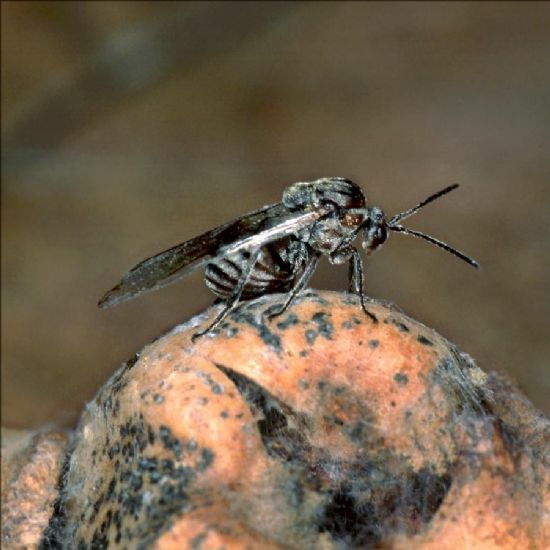 Adult gall wasps of different species have been found in samples taken in aerial currents at high altitudes. A. quercuscalicis has since spread steadily throughout England, Wales and parts of Ireland. The invasion front extended slowly northwards and by 1994 it was present at Alnwick, Northumberland on the east side of England and at north Lancashire to the west (Walker, pers. comm.). The first Scottish Knopper galls were collected in 1995 at Canonbie (35/396717) and later at Threave Gardens (25/684517) in Dumfries & Galloway region (Walker, pers. comm.). In early 2001 Knopper galls were reported in the west of Scotland from Lanfine Estate, Newmilns in Ayrshire in 2001 (Hancock, 2001) and in Gosford near Aberlady to the east (Muscott, 2001). From a small sample of 85 specimens collected at Mar Hall Hotel parkland, Renfrewshire in 2002, 21 identical insects emerged in late January and early February 2003. These were positively identified as asexual female Knopper gall wasps by E.G. Hancock, Glasgow University. The galls were retained for many months after the last gall wasp emerged. Inquilines and parasitoids specific to the invading knopper galls are presently being studied as models for population dynamics. No inquilines or parasitoides associated with A. quercuscalicis appeared from the samples collected. It is interesting to note that nearly all the locations listed in the above tables were formerly country estates in which many exotic plants and trees, including the Turkey oak, would have been introduced at some time in the past. A closer search of these areas could well confirm the presence of Turkey oaks somewhere in the vicinity. 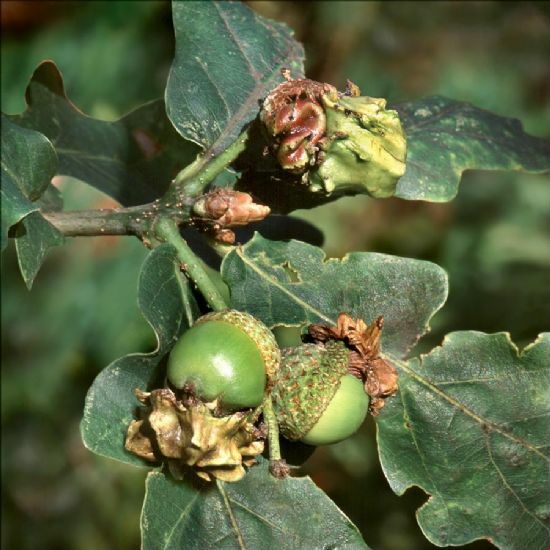 Although exceptionally large numbers of knopper galls were found on some of the oaks in Mar Hall grounds during 2002, it is unlikely that their presence there would have been overlooked during visits to the area in 2001. Acorns are produced every year, but it is only every second year that large numbers mature. In alternate years large numbers of young fruits are produced but are aborted in June and July. Observations showed those oaks, which were heavily infected by Knopper galls in 2002, produced only a few galls in 2003. Others oaks which were only lightly or unaffected by the Knopper gall wasp in 2002 were found to be heavily infected with galls in the following year. The authors are grateful to Geof Hancock for confirming our identification of the insects that emerged from the galls. Many thanks to Graham Stone for sending various papers relating to the life history of the Knopper gall wasp and thanks also to John Mitchell, Dr Keith Futter and Dr Patricia Walker for sending details of their unpublished records of recent discoveries of Knopper galls.